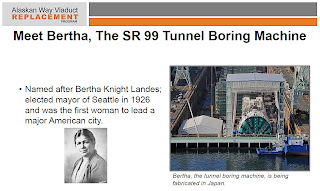 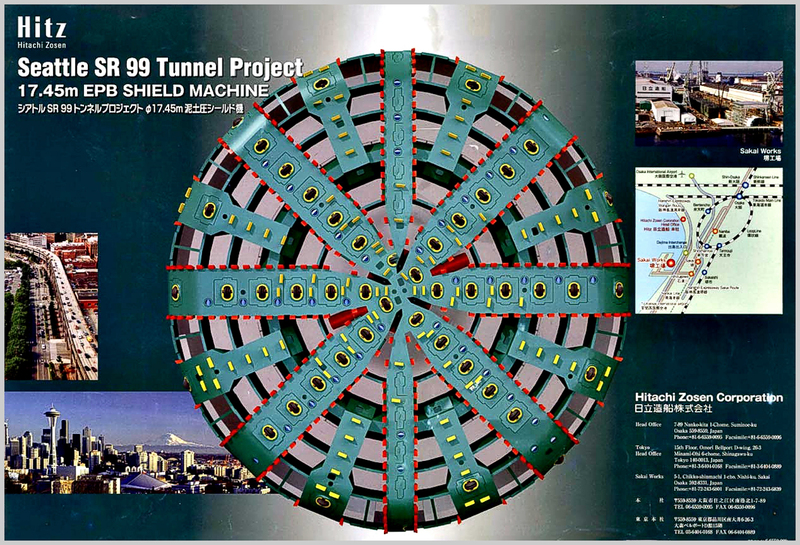 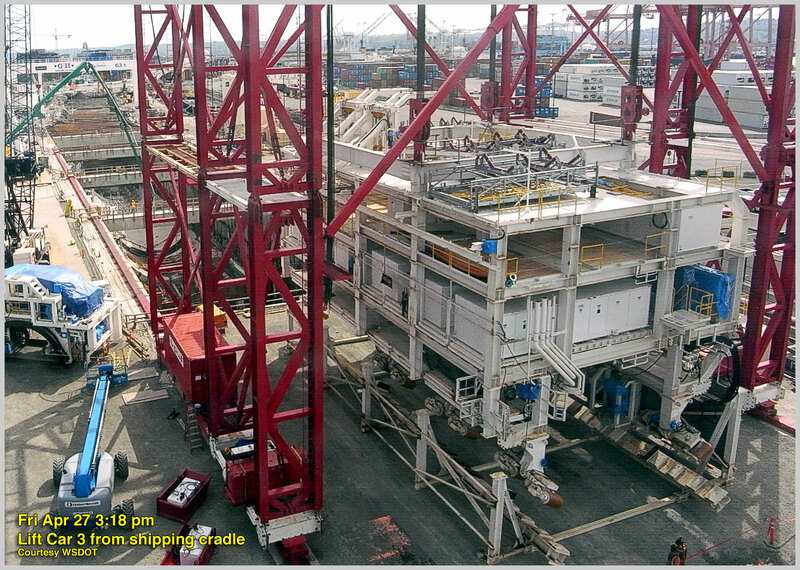 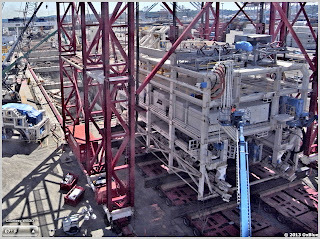 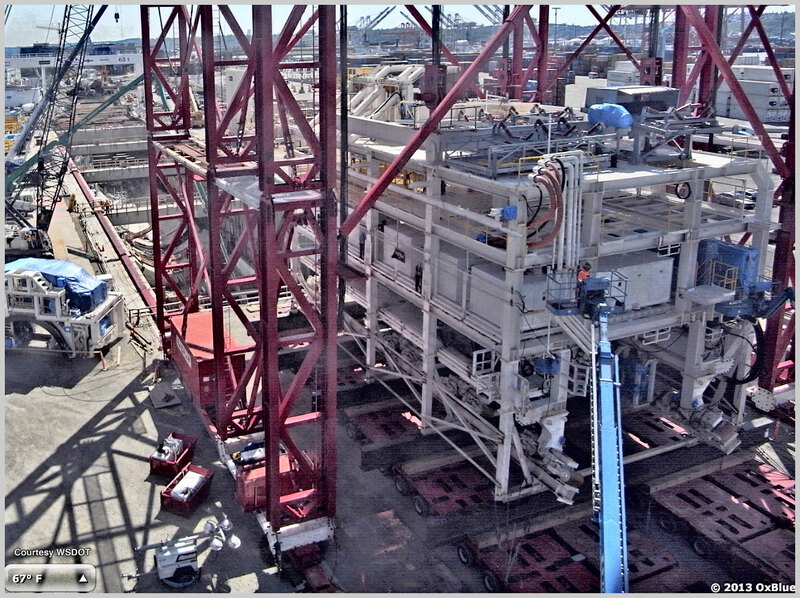 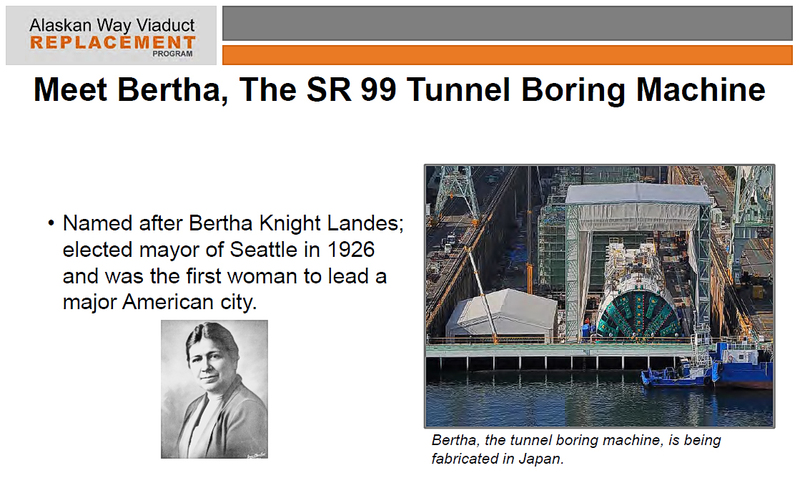 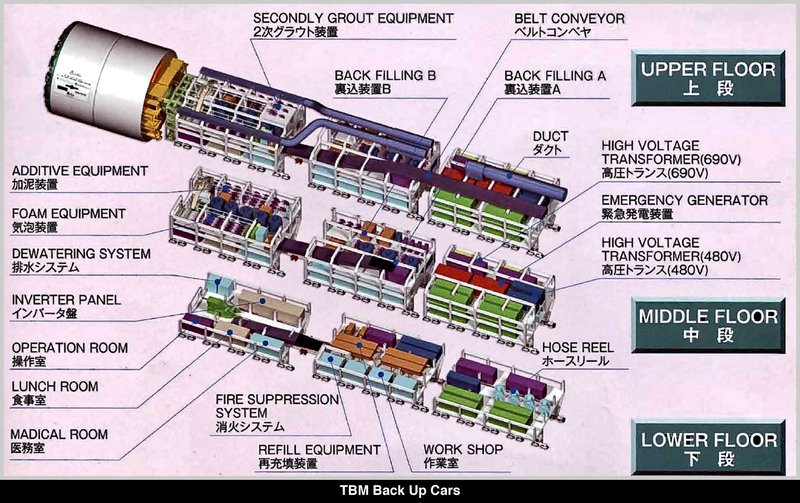 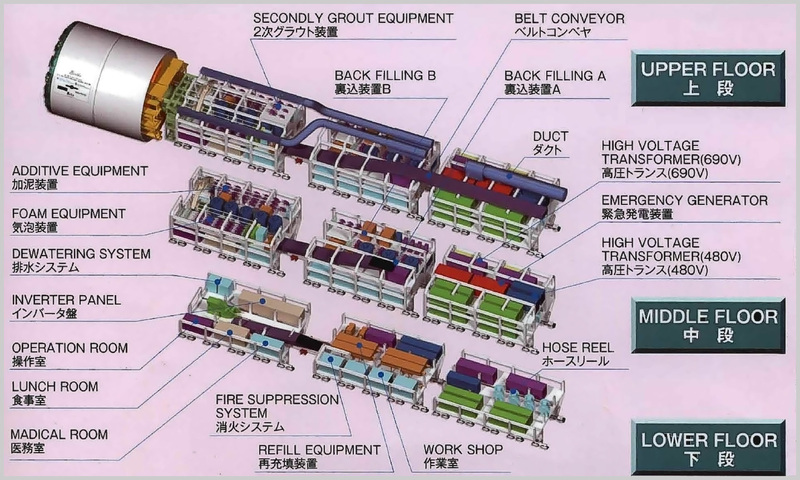 "Bertha," as she has become known, was first assembled and tested in Osaka. 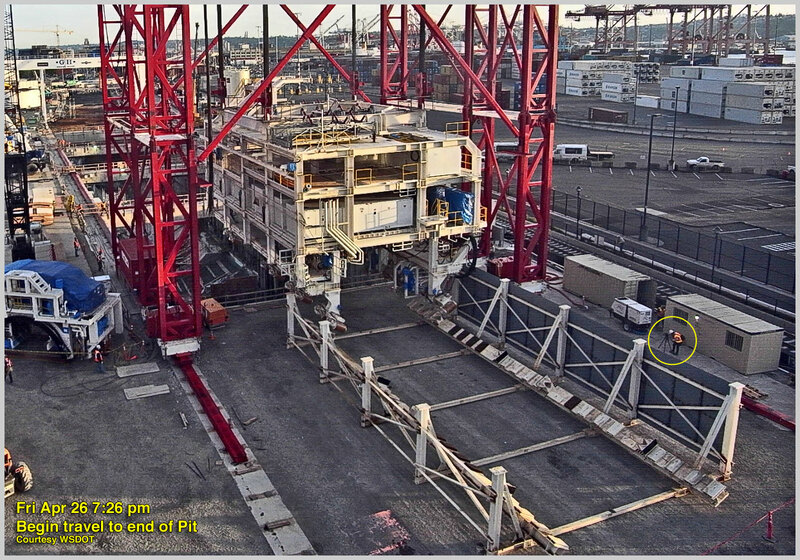 Following proof of performance, she was de-constructed into 41 pacakages. 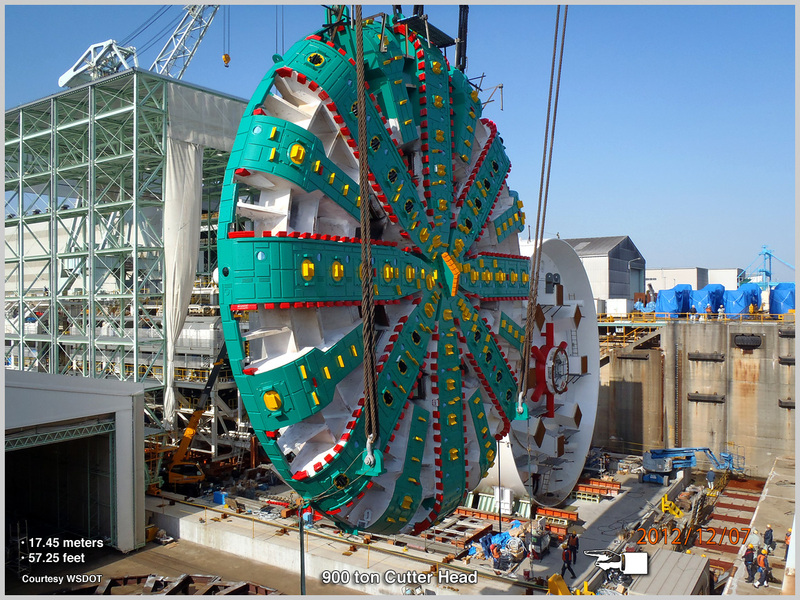 These are now being painstaking re-assembled in an 80-foot ( 24 m) deep "Launch Pit." 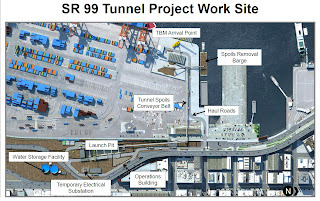 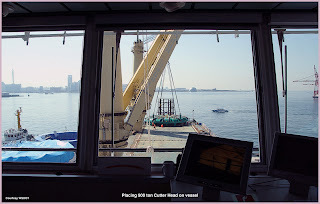 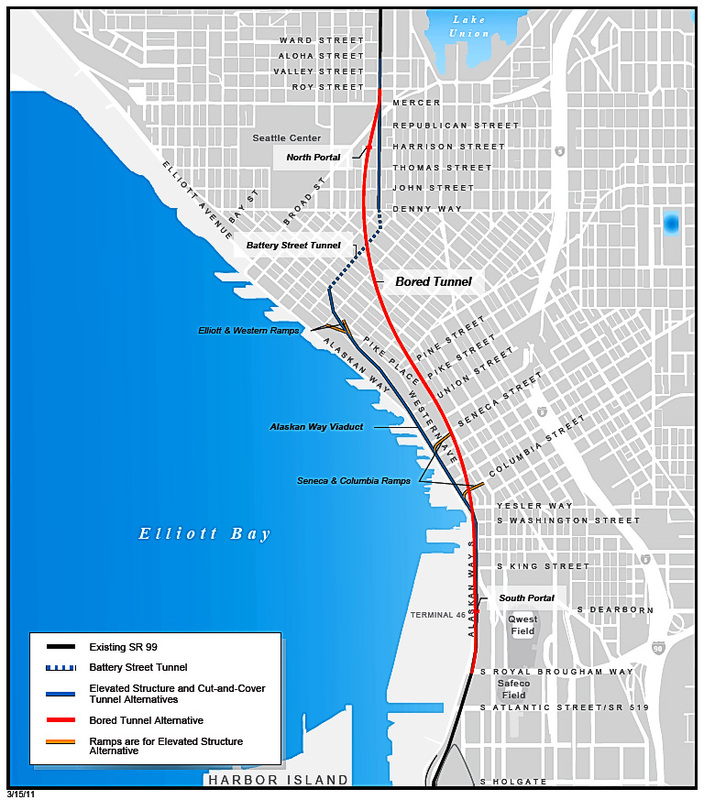 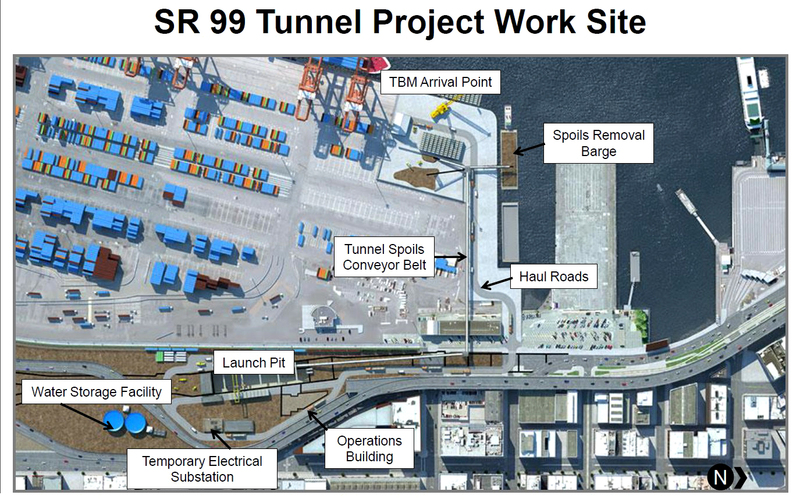 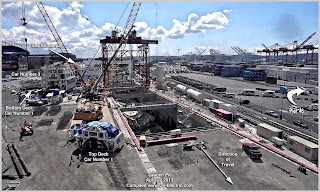 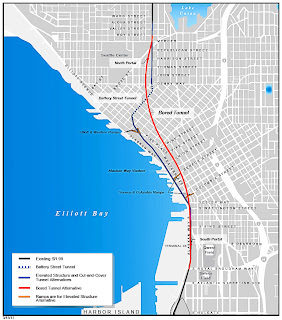 After a couple of "false" starts, I called the State Route 99 (SR99) project office to gain an understanding of why Car 3 was back and forth under the gantry crane. 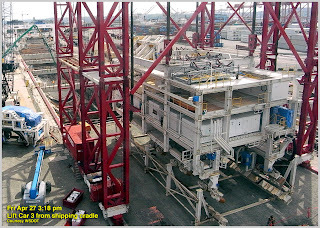 Turns out her top deck had to be removed for the placement of electrical transformers. 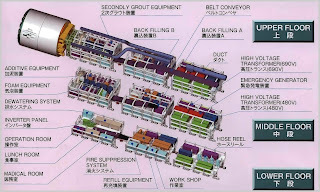 One 690v, the other 480v; see diagram above. 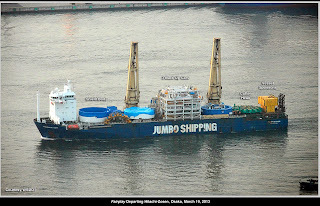 Finally, on Friday April 26, the exciting part began. 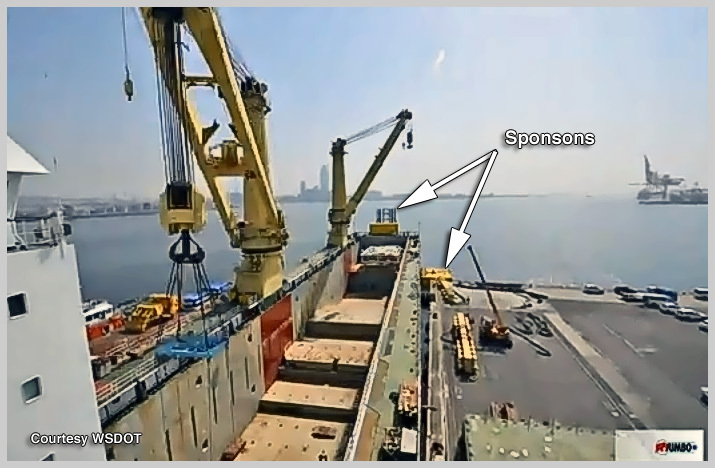 Each support car is lifted twice. 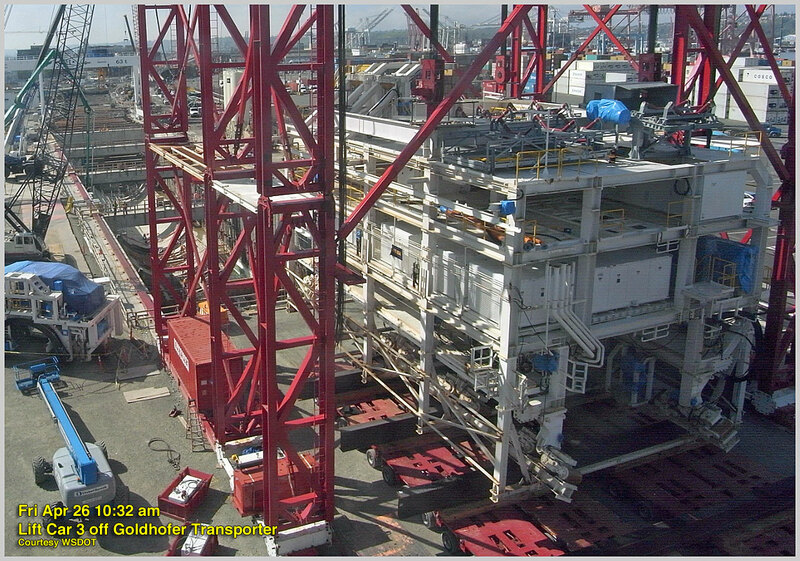 The first lift off the Goldhofer multi-axle, multi-tired transporter. The second lift the car off its shipping cradle. 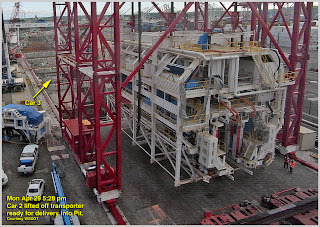 Then transport to the Pit. 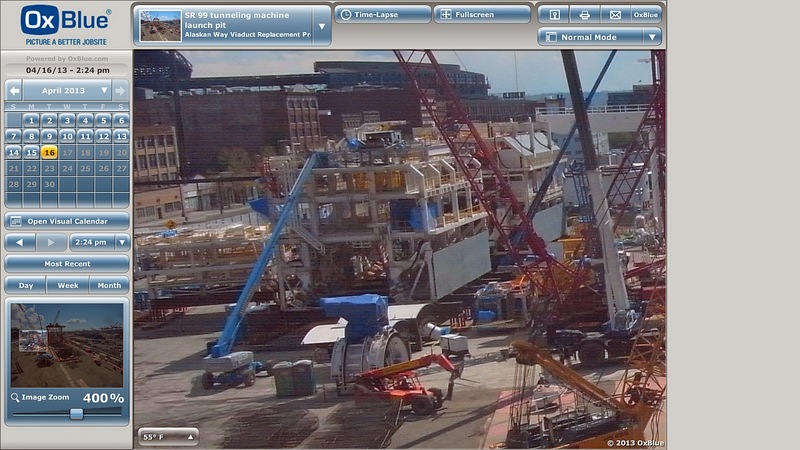 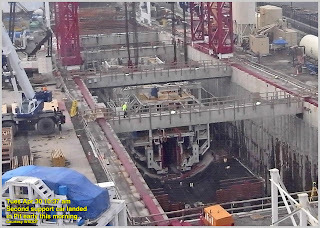 The TBM is being reconstructed rear-to-front; so Car 3 was installed, followed by Car 2 early this morning. 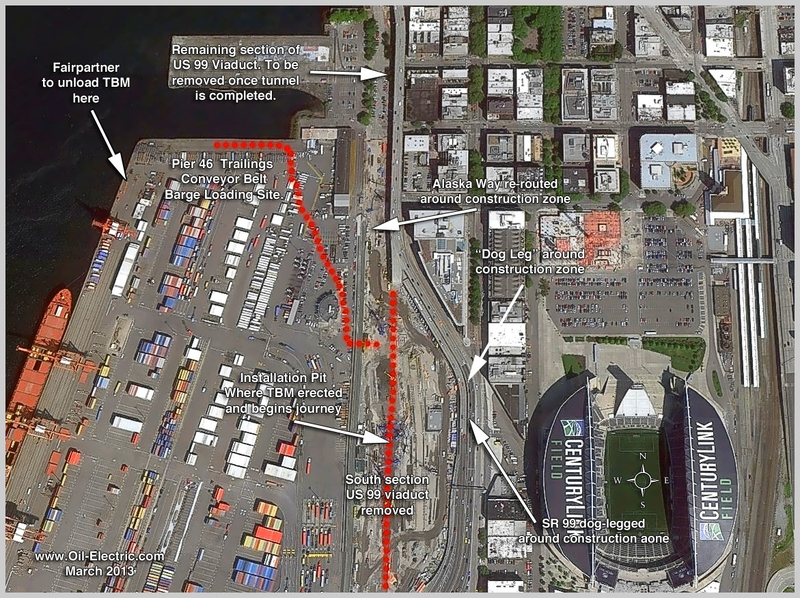 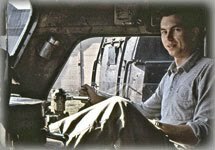 Since a picture is worth a thousand words, let the annotated photos bring you up to date. 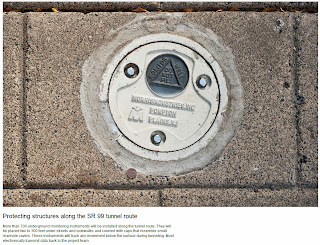 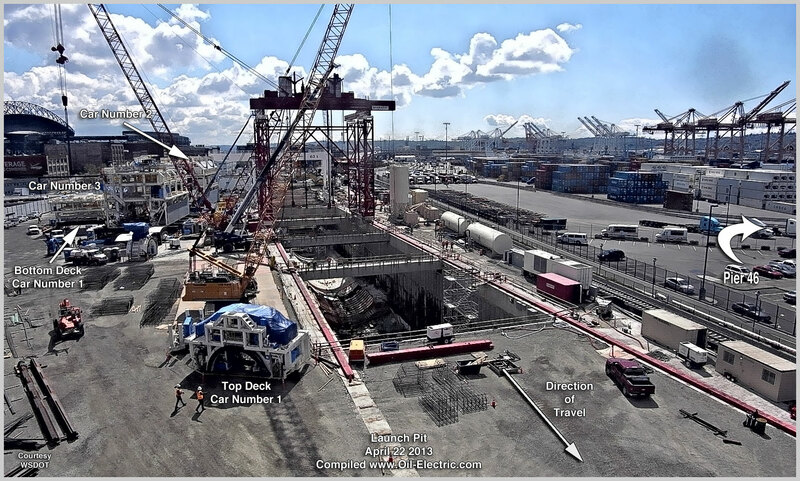 As a reminder, there is a button labeled "SR99 Web Cams" in the right hand utility column. 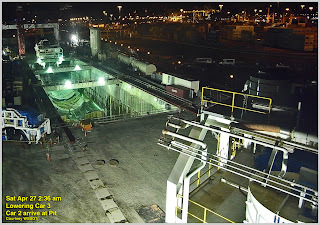 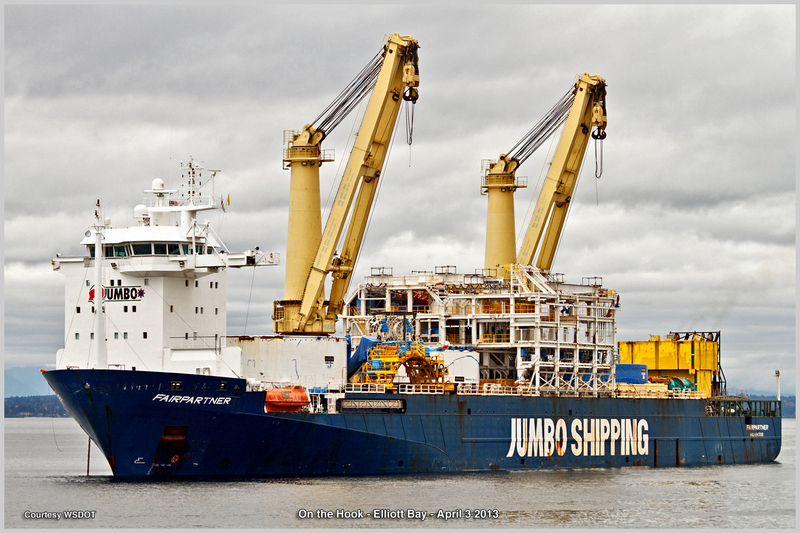 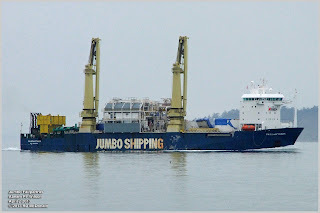 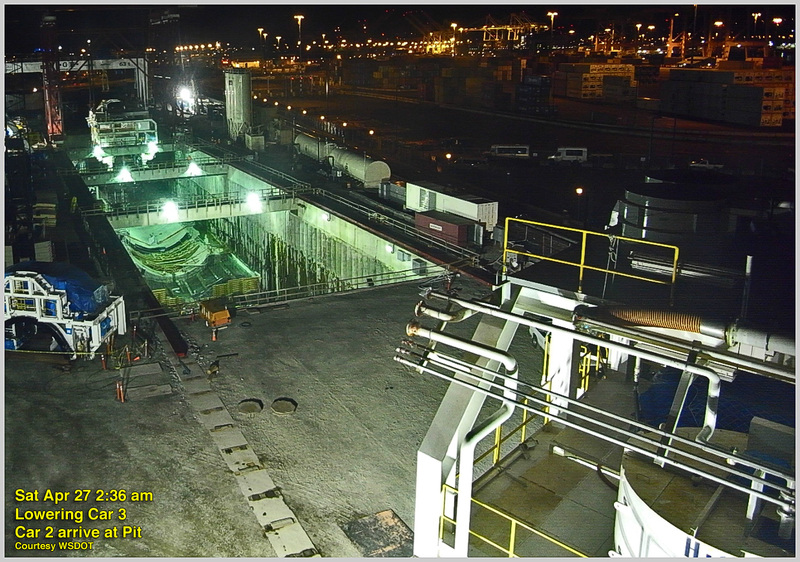 Monday night, April15th, Jumbo's Fairpartner completed delivery of the SR99 Tunnel Boring Machine (TBM) at Pier 46 in Seattle, Washington. 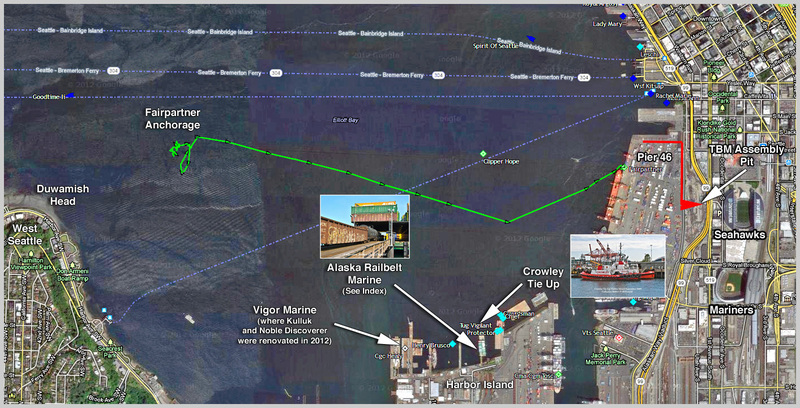 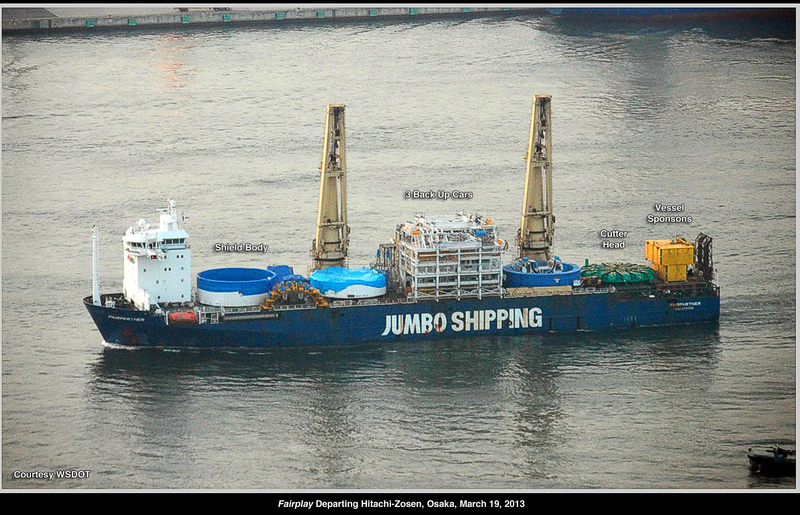 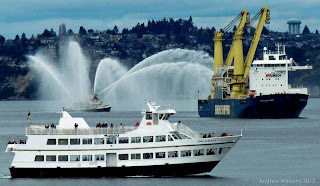 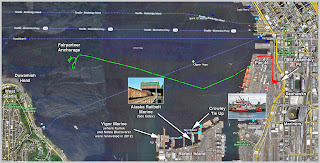 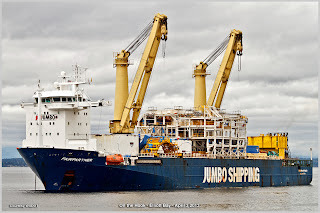 And by late last Tuesday afternoon, she cleared the Strait of Juan de Fuca, making for Dalian, China. 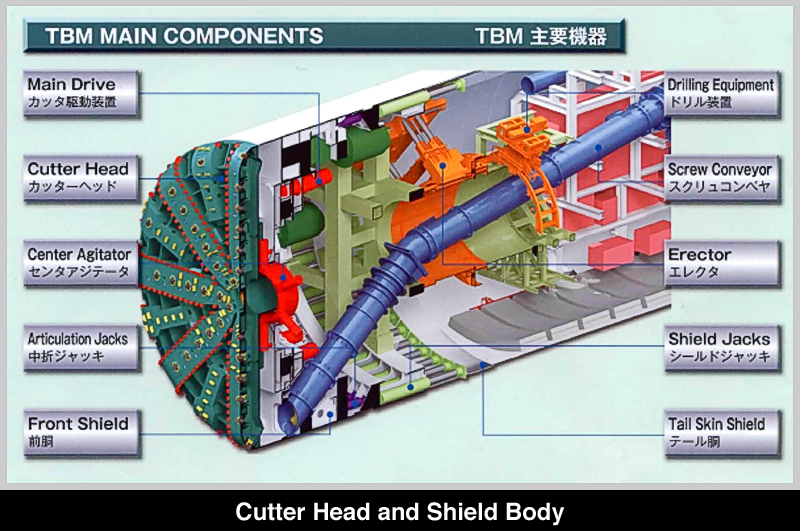 Resembling the parts of a giant child's toy-set, the next step is to re-assemble the 111,940 m (367 ft) long TBM in the Launch Pit. 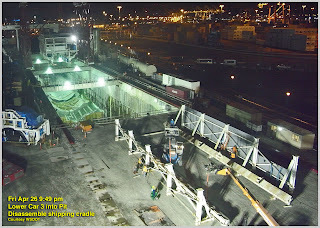 This is expected to take a few months to complete. 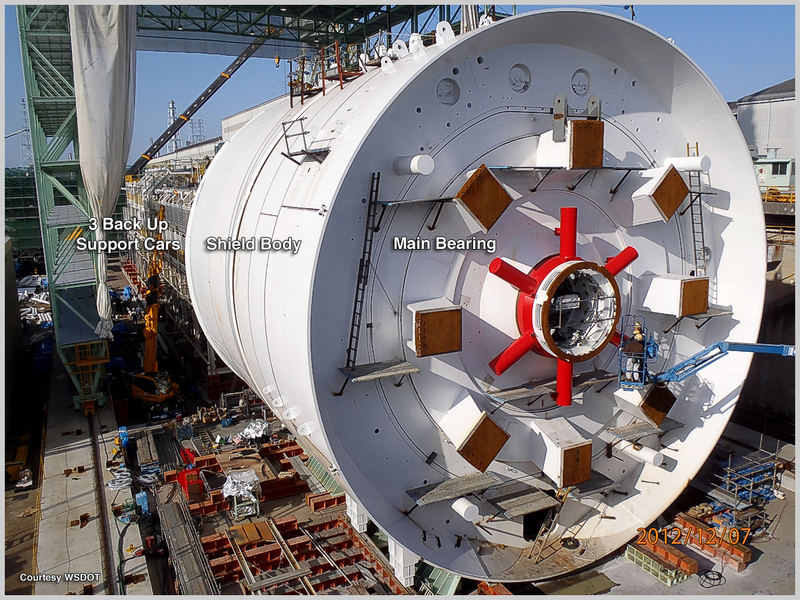 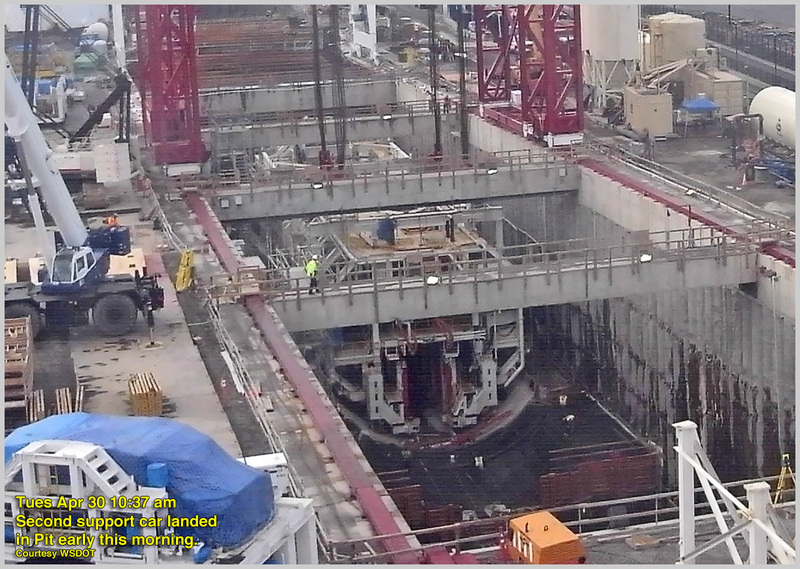 The boring machine is re-assembled from rear to front. 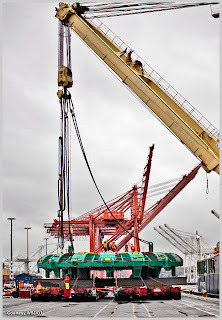 Late this afternoon the 3rd car was maneuvered into place riding on two Goldhofer self-propelled mega axle/mega tired transporters. 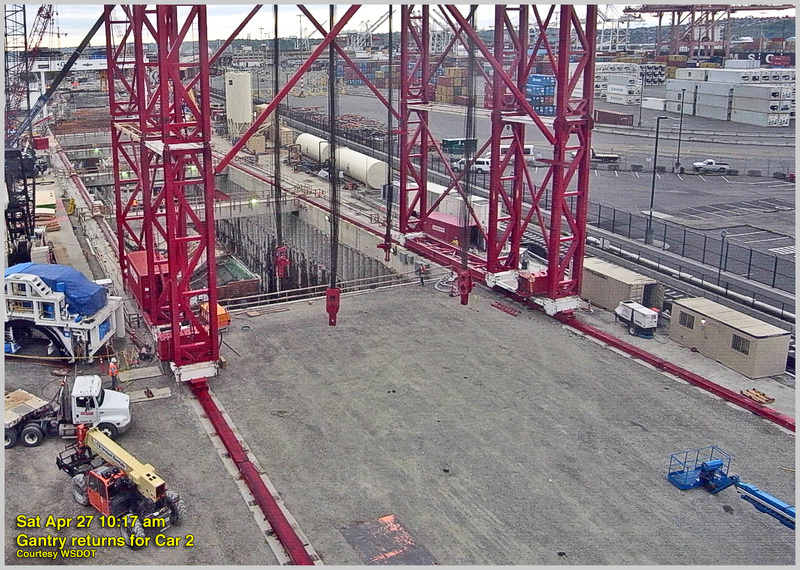 In a few days, the red track mounted gantry crane will lower the car into the pit. 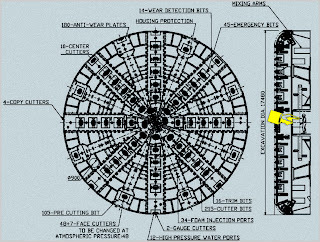 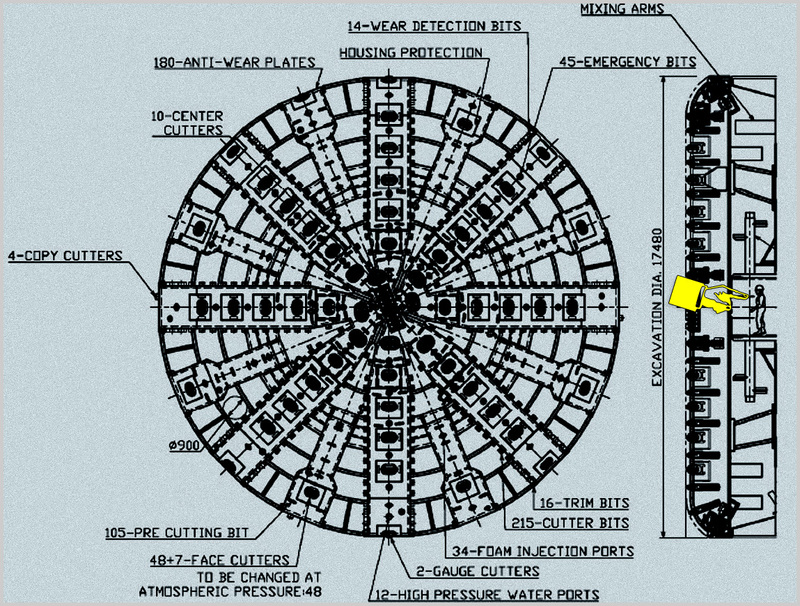 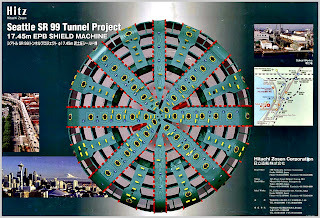 The support cars following the boring shield, carry a galley, machine shop, and construct the tunnel liner. 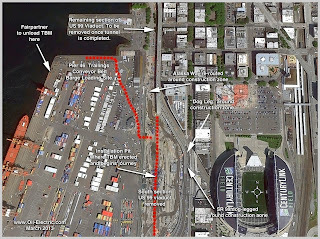 Once again, the Washington State Department of Transportation has made this multimillion-dollar project accessible to all "sidewalk superintendents" by installing a handful of construction web cameras. 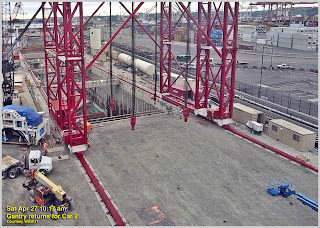 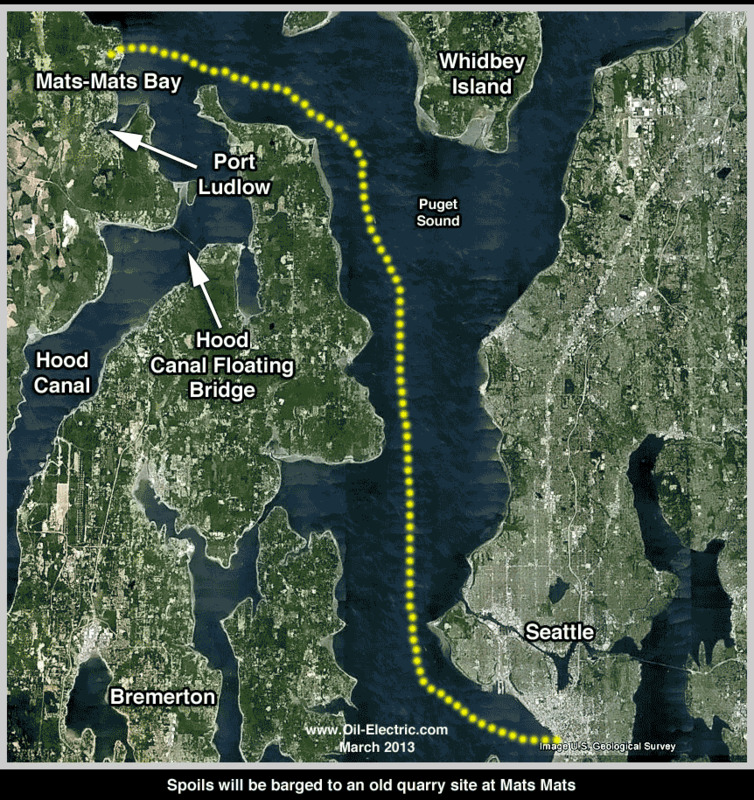 I've installed a button in the right margin, providing a link to WSDOT Construction Cams. 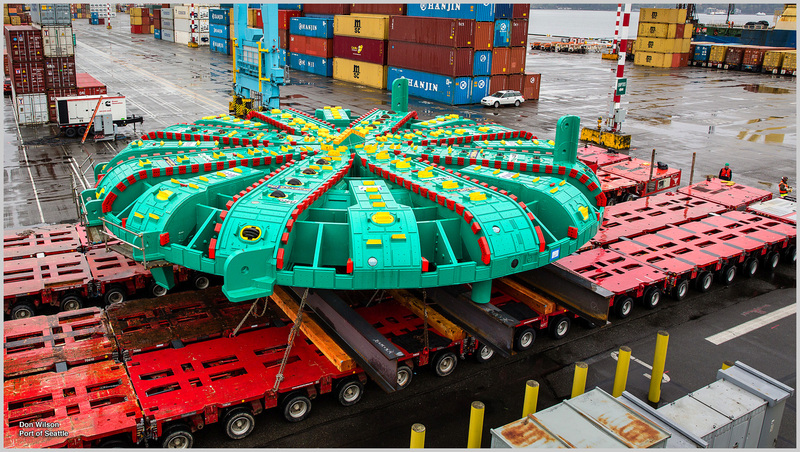 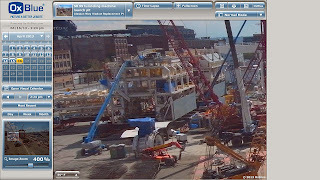 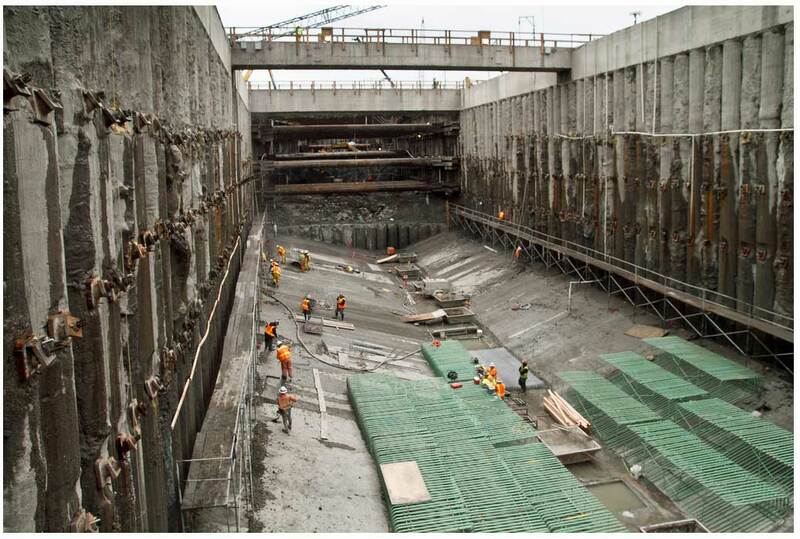 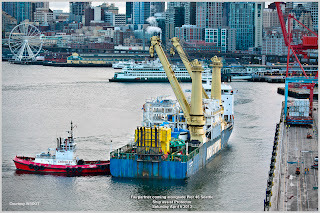 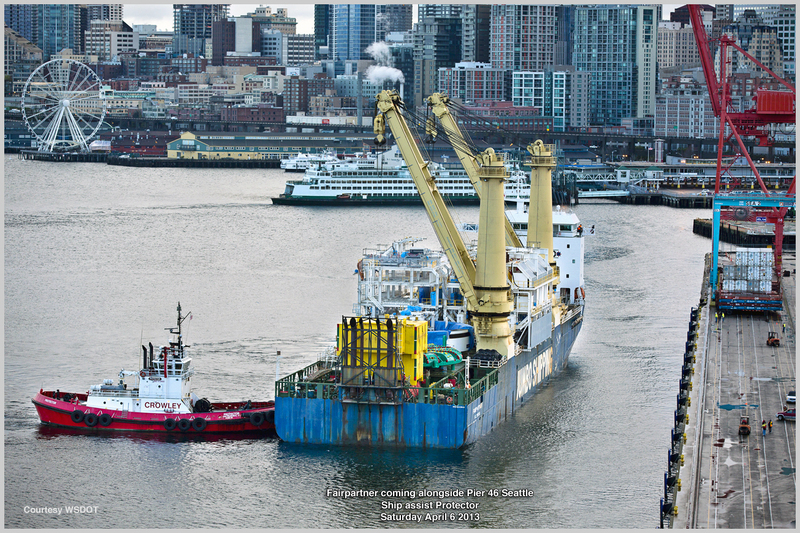 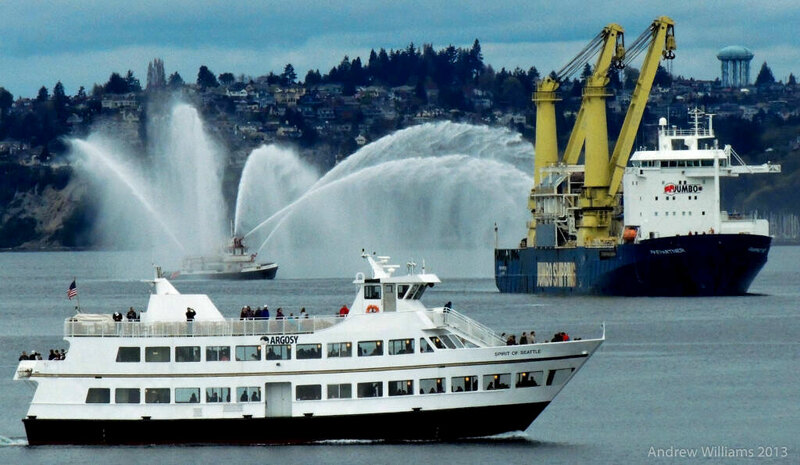 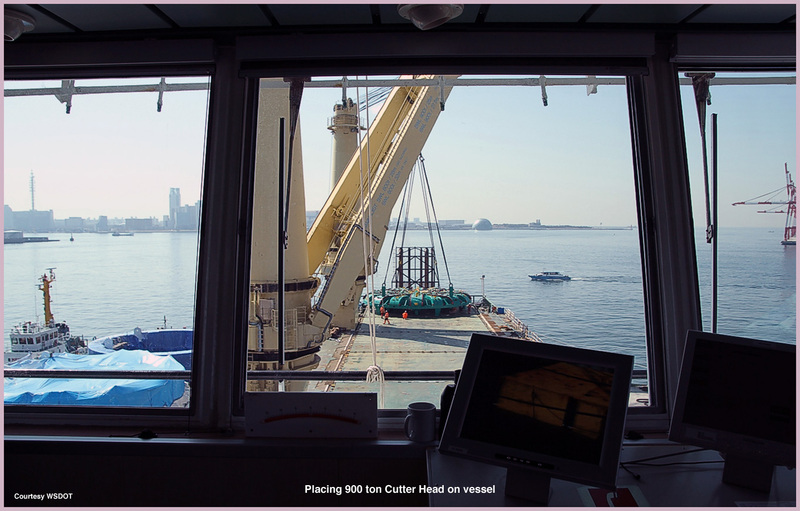 The 887-ton Cutter Head was the first piece of Seattle's SR99 Tunnel Boring Machine (TBM) to be landed at Pier 46 from Jumbo Fairpartner. 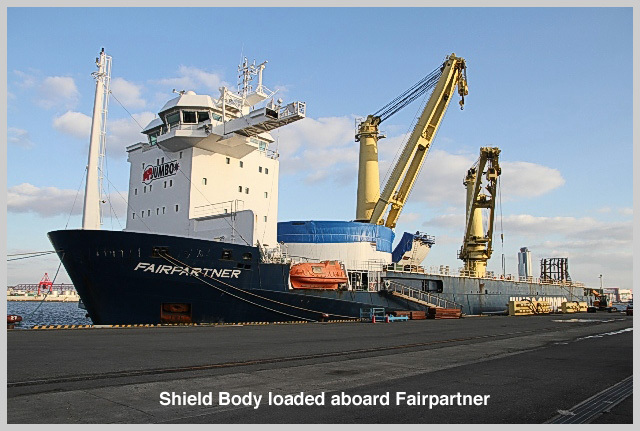 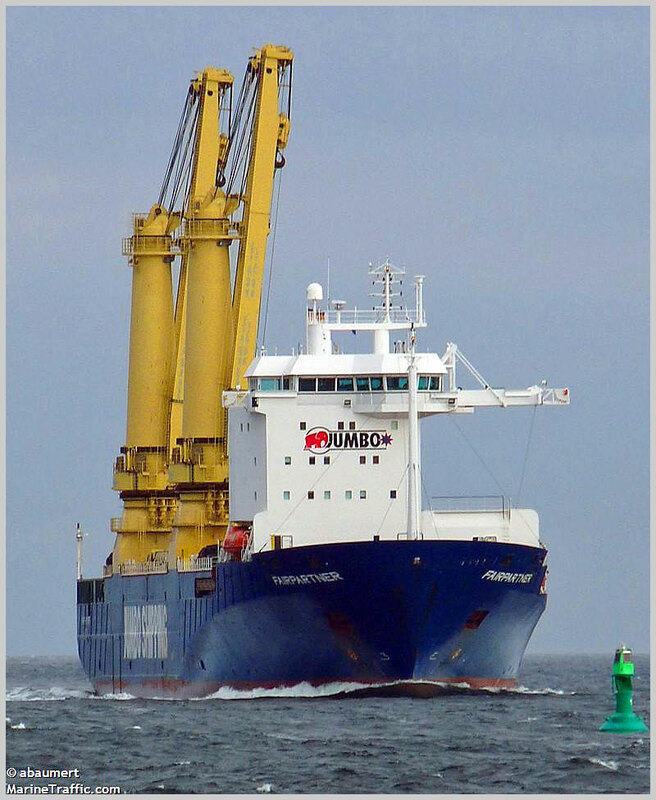 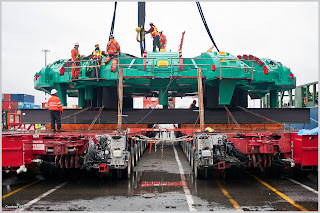 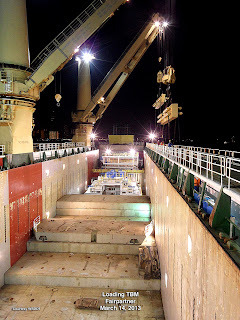 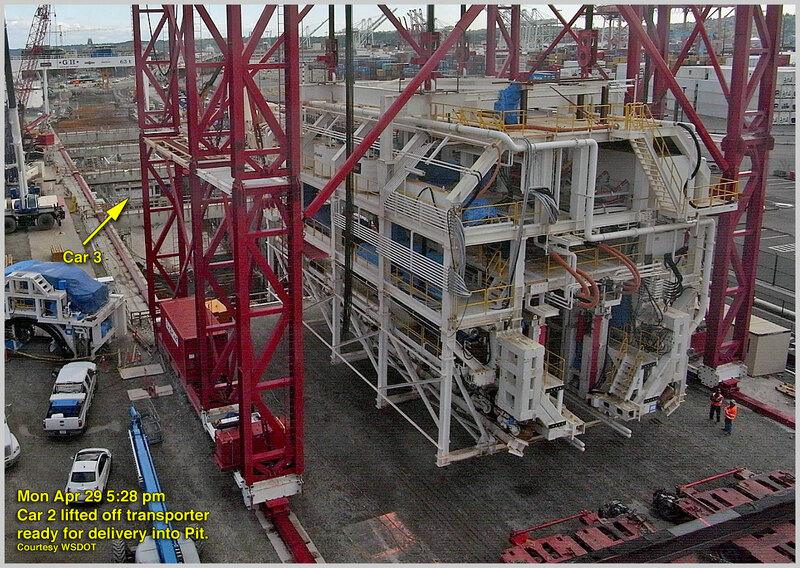 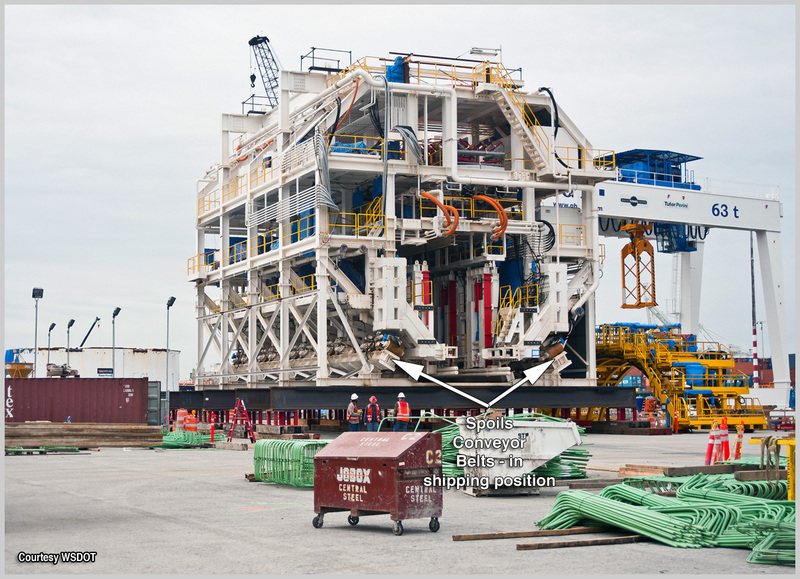 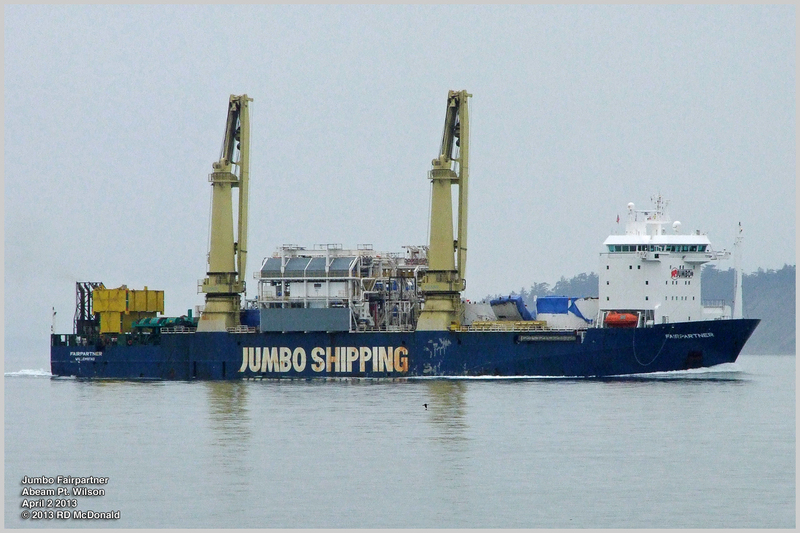 The massive 17.48 m (57.5 ft) diameter Cutter Head was carefully placed on two Goldhofer self-propelled mega axle/mega tired transporters. 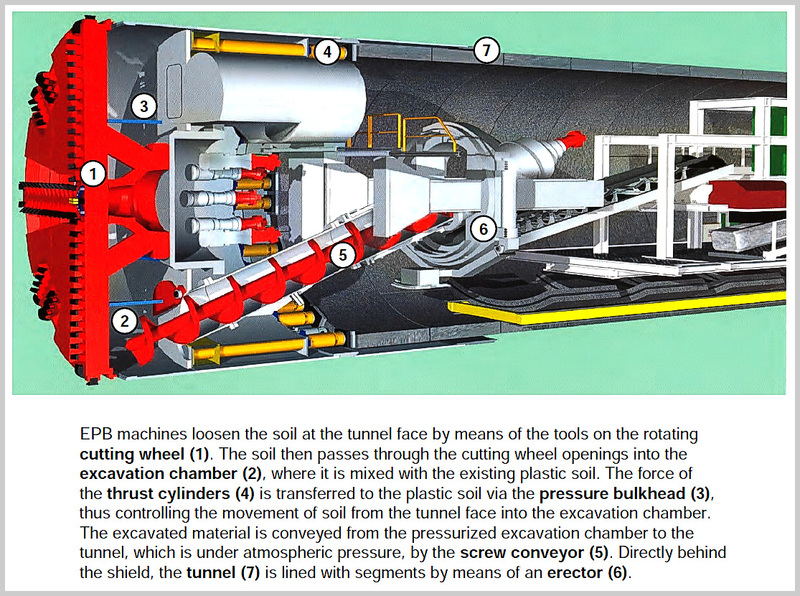 The configuration of cutting heads is matched to the type of material being bored through. 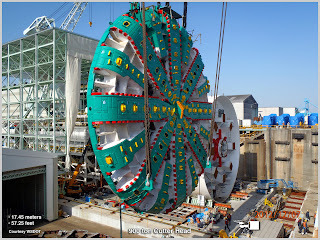 For example, the TBM gnawing through the Alps is designed to cut through hard rock - old hard rock. 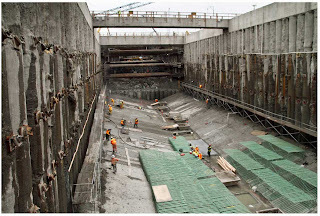 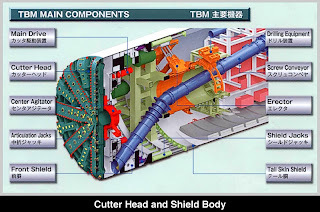 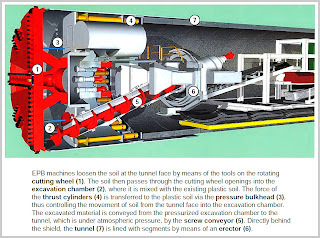 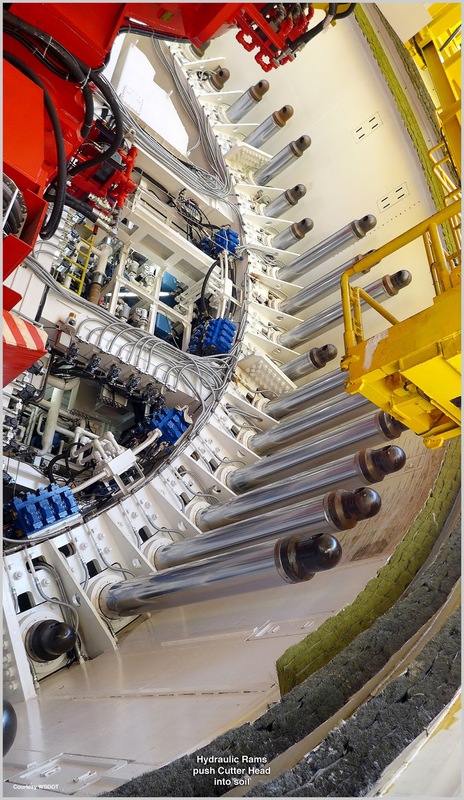 Designated as an Earth Pressure Balance TBM, this type of cutting head was developed in Japan in the 1970's to deal with silt and clay, sand and gravel, and glacial till. 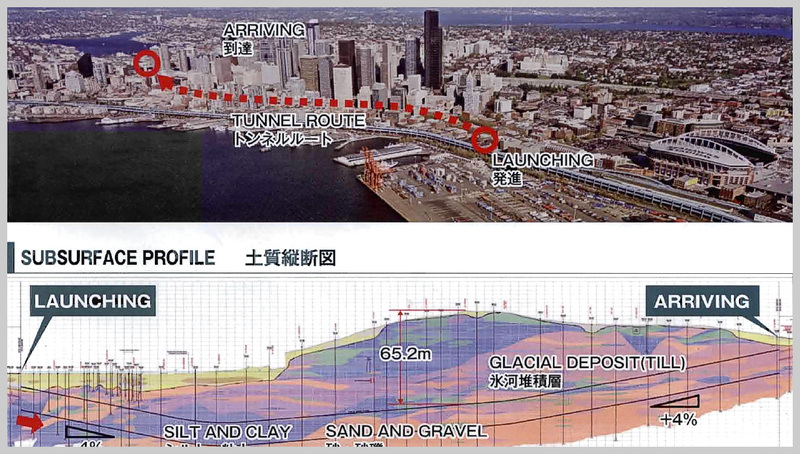 This is the very soil structure Seattle lays upon. 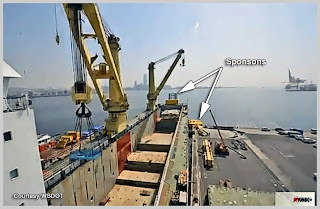 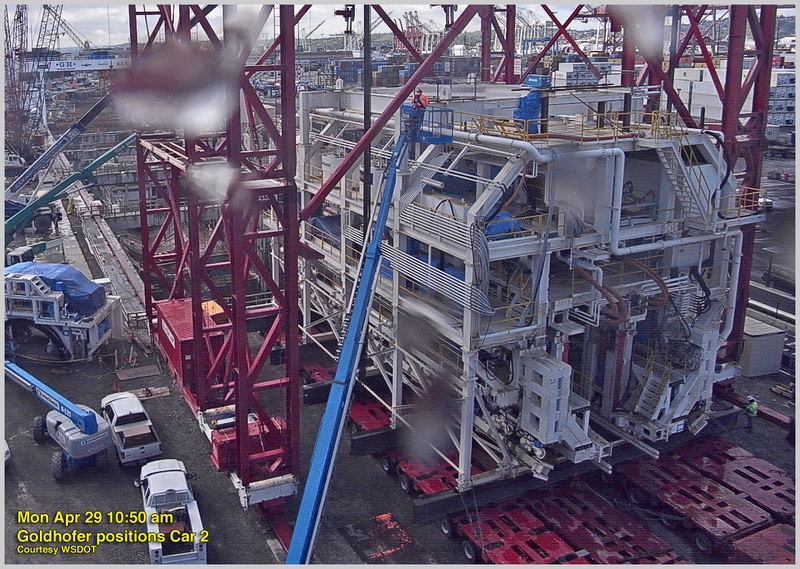 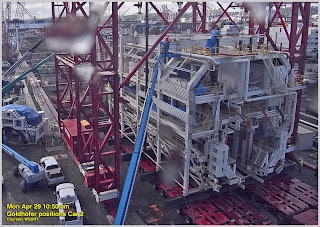 The upper body of one of three support cars was unloaded on Tuesday the 9th and parked on screw jacks, awaiting it's succession in the TBM re-assembly procedure.